A half-striped zebra cast aside by his superstitious herd embarks on a coming-of-age quest to prove his worth. Khumba, a half-striped zebra born into a superstitious stripe-obsessed herd in the Great Karoo Desert, is abandoned by his peers after they come to believe him responsible for the intense drought impacting their region. 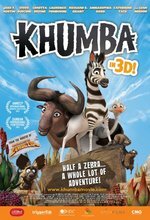 Emboldened by a desire to prove his worth, young Khumba ventures out into the wilds of the animal kingdom all on his own, befriending an ostrich and wildebeest on his way to building up the courage and self-confidence necessary to save his animal brethren.